I think I have mentioned before that I am a rubbish sew-er, an impatient, corner cutting seamstress. This was proven to me big time today when I tried to make some simple felt slippers. You see, excitingly, our house is progressing. This morning Carpet Derek came and laid 100% wool down on our bedroom floor after a good week of plastering and painting. This is fab, as it means that when the baby comes (I am 37 weeks today!) we will have at least one snug little room. However, today’s dillemma was that we have this lovely new carpet in one spot, and rancid, dusty (cool looking though) floor boards everywhere else. It will be far too easy for that muck to creep into our creamy lushness. Clearly, I need some slippers to leave at the bedroom door! Having just been to a jumble sale at the Camberwell Sallies, organised by Mel, and picked up a wooly jumper for 10p, I quickly stuffed it in the machine on hot and felted that bad boy. 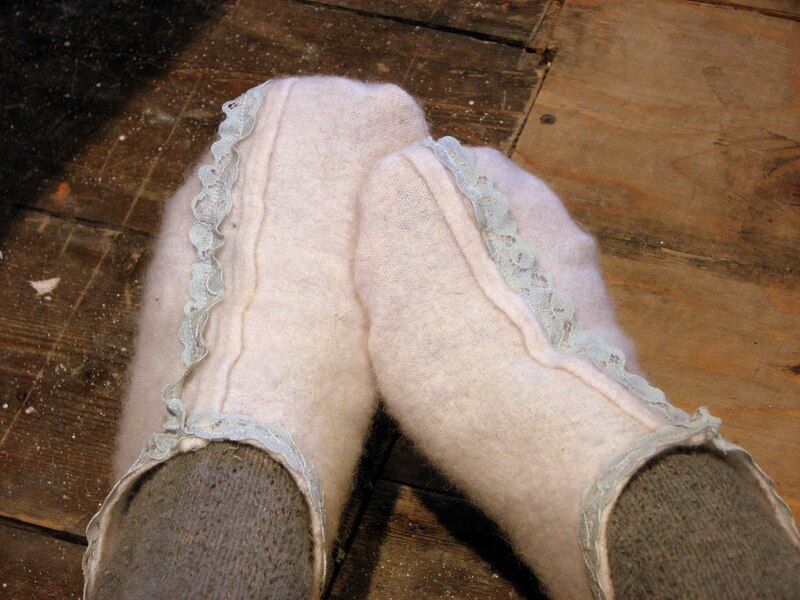 I then googled “simple felt slippers” and came across a couple of really lovely options. Rather than limiting myself to one recipe, I thought I should sort of mix them. I was aiming for Martha’s neatness but rolling with Mary Jane’s more freestyle feel, and um, just like when I do baking combos, it was a fail. I got one slipper. It was properly ugly and about 3 times too big. I was pretty mad after measuring my foot and cutting out newspaper and Everything. In my madness I put my foot in the armpit of the jumper. Hello!!!! 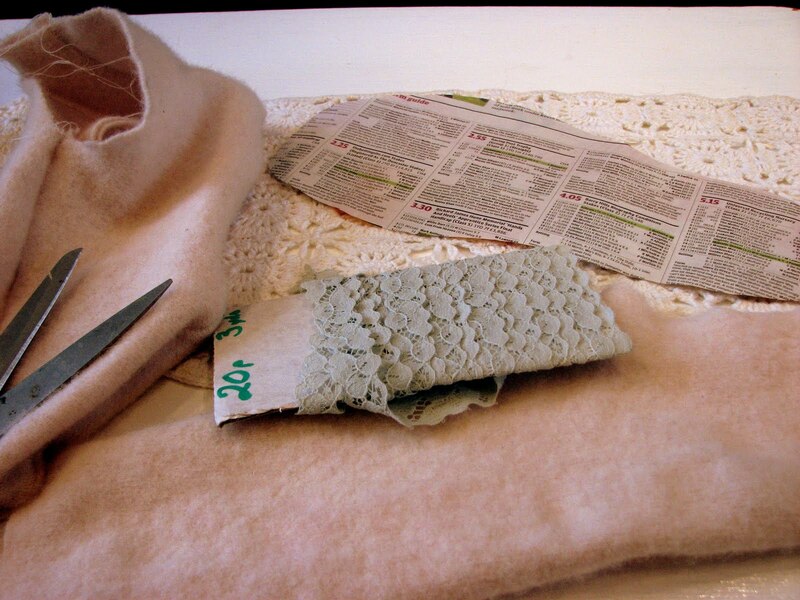 I had stumbled upon the easiest felt slipper ever- it was basically ready made! How I have managed to make the most simple of all sewing projects even more basic I will never know. Put foot in armpit of felted wool jumper. Toes pointing toward wrist end of sleeve. Snuggle your foot down till it feels cosy. Cut off the excess jumper hanging off the back of heel, and excess sleeve hanging from your toes. Sew a point around your toes. Done! Then, if you have some lace, or other goodies you’ve picked up from a carboot, wack that on and voila. Below- the six minute beauts that will save our new carpet, hurrah! Posted in Craftiness, Whoops didn't tag these puppies. Bookmark the permalink. This is really wonderful! 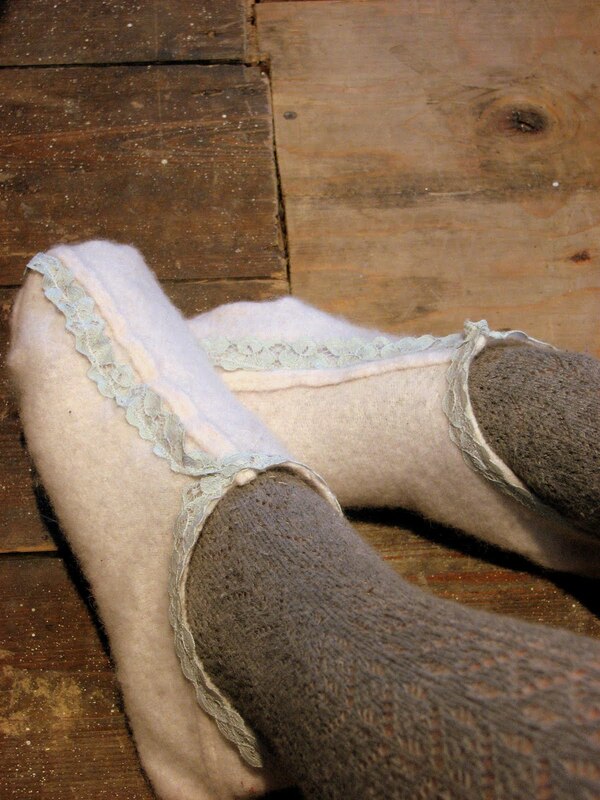 I've been looking on and off for days for a felt slipper project that's my speed, and this looks perfect. Thanks for posting.